Completed applications, with all supporting documentation, for the Loudoun Habitat for Humanity Home Ownership Program will be accepted May 1 - 31, 2019. 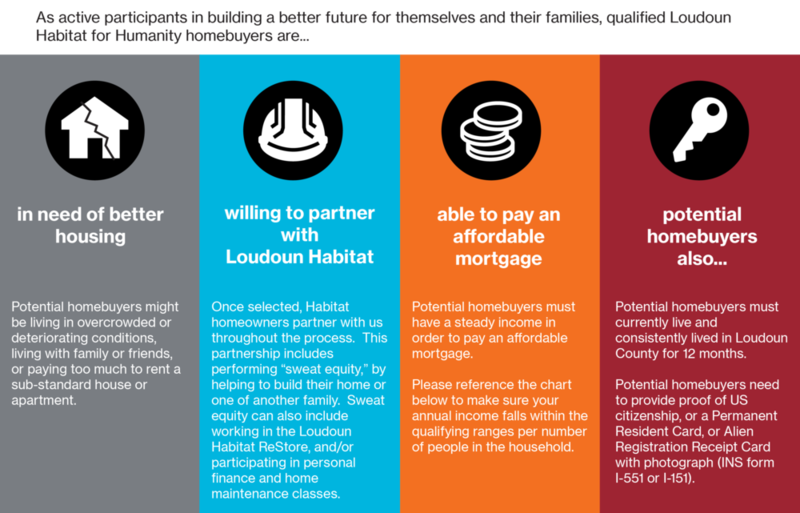 Loudoun Habitat Home Ownership program applications will be available beginning May 1, 2019. Between May 1 and May 31, 2019, applications will be available at our office located at 700 Fieldstone Drive, Suite 128, Leesburg, VA; at a Home Ownership Information Session, or through this web page. Monday, May 6, 2019, 6:30 - 7:30 p.m., Gum Spring Library, Stone Ridge, VA. Click here to register. Tuesday, May 7, 2019, 6:30 - 7:30 p.m., Purcellville Library, Purcellville, VA. Click here to register. Thursday, May 16, 2019, 6:30 - 7:30 p.m., K2M Headquarters, Leesburg, VA. Click here to register. Saturday, May 18, 2019, 10:30 - 11:30 a.m., Crossroads Baptist Church, Leesburg, VA. Click here to register. Saturday, May 25, 2019, 10:30 - 11:30 a.m., Sterling Library, Sterling, VA. Click here to register. Wednesday, May 29, 2019, 6:30 - 7:30 p.m, K2M Headquarters, Leesburg, VA . Click here to register. Please review the Home Ownership Program qualifications and process information on this website. If you have specific questions after reviewing this information, please email our Homeowner Services Manager, Julie Steele via this link. Minimum & Maximum gross income limits are based on 30%-60% of Area Median Family Income (AMI) as set by HUD for the Washington DC Metropolitan Area FY2018. *Maximum income amount is dependent upon federal funding sources for individual homes and may be lower than 60% AMI. Steady income for the past 12 months. Reasonably good credit record with debts being addressed by timely payments or other special arrangements. Perfect credit is not required, we are looking for responsible applicants. Have not had a foreclosure or bankruptcy within two years. Click the image below to see more information about each phase in the process to homeownership. The process from applicant to homeowner typically takes 12 to 24 months.